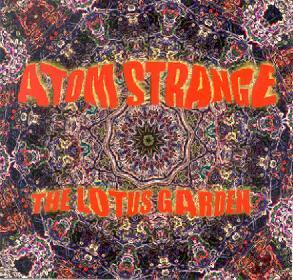 Atom Strange - "The Lotus Garden"
There's something quite enticing in an almost nostalgic way to Atom Strange's lo-fi, psychedelic rock n' roll. Strange was the former guitarist for the Sanity Assassins, and brings from that band a gritty edge to his sound, but tempers it with catchy melodies and groovy lyrics on this enjoyable 5-song EP. The EP opens with Rearview Mirror, a nostalgic pop paean to cars and lost love, with a great guitar solo. Strange puts some nice reverb on his vocals giving the music an almost live feel. Penney For Your Thoughts has some shimmering, jangly guitar melodies and cosmic lyrics. Fading Fast is built on a catchy chord sequence, and has some truly cool, warped out psychedelic guitar breaks in it. Cosmic Band is a fast rocker, with a bit of a punk edge to it. Finally, The Lotus Garden is the show piece of the album, and the track most likely to appeal to fans of psychedelic space rock. You can sway slowly to the shifting, altered vocals as they flow over raunchy, tripped-out guitar and slowly pounding drums. Far out, man. There's nothing really ground-breaking here, and sometimes the production is a little too lo-fi, but it's nice to hear someone get back to basics and just have some plain old fun. You can email Atom Strange at: atomstrange@hotmail.com.